Product subscriptions and memberships are becoming very popular products, and EasyCart allows you to handle them with very good flexibility. In order to utilize subscriptions, you do want to use the ‘stripe.com’ payment method, which you can learn more about by Clicking Here. Not all payment gateways work with subscriptions and recurring payments, but EasyCart has a good comprehensive integration that allows users to sign up on a subscription plan, even upgrade/downgrade and keep credit card information current on stripe.com. Select if you want to offer this product as a subscription. Subscriptions are treated as a single product sign-up, so subscriptions do not get put in the shopping cart like regular products. Instead, subscriptions take the user to a sign-up form and payment form all in one page for quick registration and payment. Subscription Interval – Set how often you want the recurring payment to occur. Billing Duration – How many recurring occurrences do you wish for this subscription to have. Trial Days – Set how many trial days occur before the charge actual takes place. Initial Fee – This fee is added to the recurring fee the first round of payment. Allow Multiple Subscriptions – This will allow the same account to order the same product again. Prorate on Upgrade/Downgrade – This will prorate the payment during an upgrade/downgrade to a different plan. Stripe Plan – This is the grouping to which this subscription belongs to. 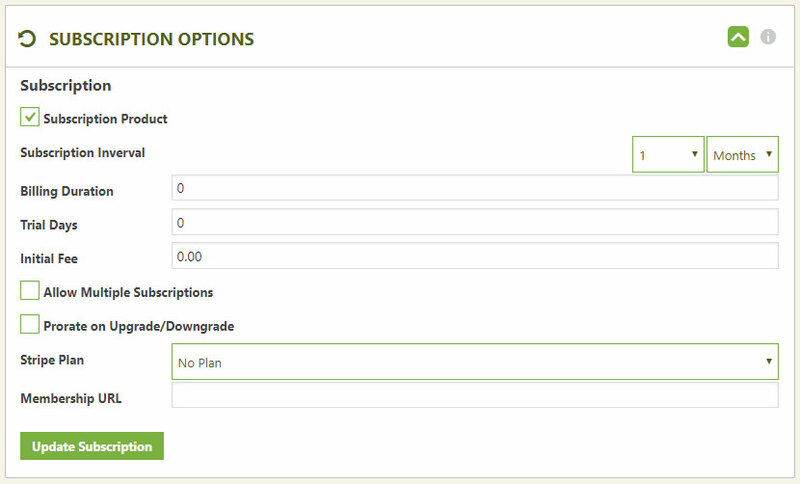 Subscription plans are often used to sell similar products and allow upgrading/downgrading from within a plan. For example, a Bronze, Silver, Gold membership plan and allowing customers to upgrade via their account between those plans. Learn more about creating a plan by Clicking Here. Membership URL – If you want to offer a specific page with content on it that only members can access, enter the url here. Customers will receive this link upon subscribing. EasyCart also offers membership shortcode for this membership page to allow you to block regular access accept for paid members. This solution makes a great way to feed a custom wordpress page with downloads, videos, content and more to your paid members.